Another of the things I love to do is cook, so I decided that I would start to share some of my favorite recipes now and then. This is one I have had for about 30 years and it is a well loved recipe. I hadn’t made any in years and came across it again when looking through my recipes for Christmas. It makes a lot, but you will be glad it does because it disappears quicker than you would think! Grease a 13″ x 9″ pan with some softened butter. Chop up all the chocolate. In a very large bowl, mix together the chocolates, the marshmallow fluff and the salt. Set aside. In a large saucepan bring the evaporated milk, butter and sugar to a boil, stir often while it heats. Once it reaches a boil, reduce to a simmer and set a timer for 6 minutes. Stir often as the mixture simmers, rub the sides now and then to mix in any sugar that sticks. 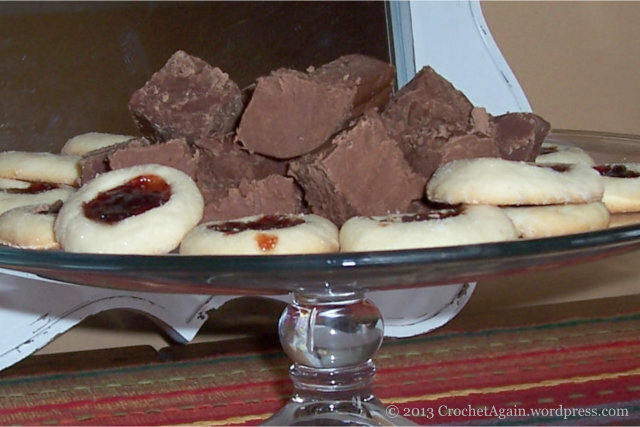 Once the 6 minutes is up, remove from heat and pour over the chocolates and fluff mixture. Stir and beat with a spoon until it is evenly mixed and smooth. Fold in the walnuts. Spread into the prepared pan and cool completely before cutting. Oh that looks soooo tasty!! 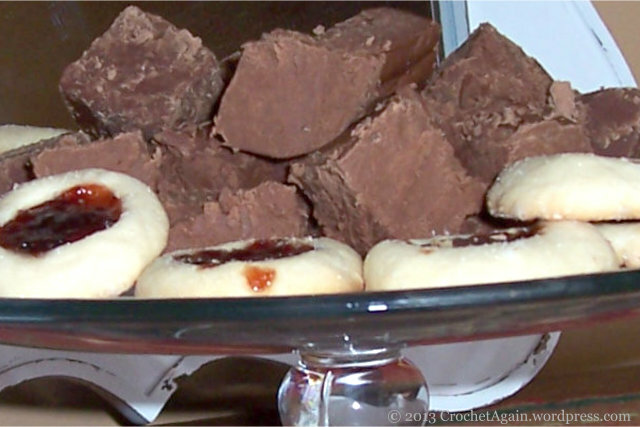 I miss making fudge…I should start doing this again. The fudge looks fab! I’m interested in comparing our thumbprint cookie recipes. 🙂 My family loves these cookies and they disappear very quickly. They are a Christmas tradition in our house. That is another recipe that I have had a long time! Although at my house, I think I like them better than my kids do. I have to make them every year, wouldn’t be Christmas without them.